Look at it this way. You use your strongest arm and most dextrous hand to punch the rod and control the reel spool during the cast. Why swap the rod over to your weaker arm and less dextrous hand to fish? Holding the rod with your right hand will give you more control over the rod when manipulating lures and give you more powerful hooksets too. There is an added advantage in holding the rod with the same hand you hold it when casting - there is no time wasted swapping hands. This should mean that you spend more time actually fishing over a full day, adding up to a considerable period over a lifetime! I believe that using lhw reels makes sense. There are other presentational benefits to be gained from not having to change hands, you can start lures working as soon as they hit the water. This can be crucial when trying to fish sinking lures just below the surface. It is much easier to stop the lure and get it working the instant it hits the water when you don't swap hands. I know the rod can be passed from one hand to the other during the cast. But why bother if you don't have to? These days there are more lhw reels on the market than at any time in the past - maybe manufacturers are starting to see sense - but the choice is still not as great as it should be. If anyone at Abu is reading this maybe you'd like to make lhw versions of the larger Morrums, and the Rockets. I'd buy them! Given that the majority of anglers are right handed, how come the majority of baitcasting reels produced are designed for left handed anglers? Seems crazy to me! I have a theory as to why right hand wind multipliers are the norm. Once upon a time I suspect anglers of days gone by naturally held their primitive rods with their right hands. So, when someone invented the the first simplistic reel, they continued to hold their rods in the right hand with the reel hanging below it - its handles (if it had any) on the left. As reels developed, gearing systems were invented, but as the early reels were not primarily designed for casting, they continued to hang below the rod with the handles on the left . When anglers decided to cast a bait directly off one of these reels they would need some means of braking the cast. Turning the rod over, placing the reel uppermost, and slowing the spool with the thumb would be a simple and practical solution to this problem. 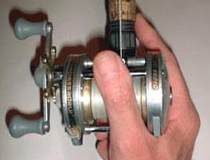 An upside down rod automatically places the reel's handles on the right hand side. As geared reels continued to be improved mechanically, nobody thought to alter the side on which the handles were placed, and as a result a tradition was formed. Anglers had no choice in the matter, and generations of baitcasters grew up accepting this anachronism, and believing it to be correct, even justifying it in preference to left hand wind at times.